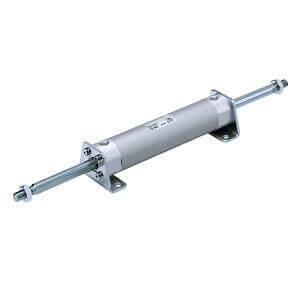 Series CG1KW non-rotating, double rod, double acting air cylinder has 6 bore sizes and can meet any application need. The tube is impact extruded aluminum to produce an extraordinarily smooth finish, allow low break-away pressure and smooth stroke action. Various mounting bracket options are available. Female piston rod threads are available as a standard option. Auto switch capable.